Aim 3: To enhance the appreciation and understanding of the common though a programme of education and interpretation. The common covers a large area and comprises a mixture of landscape types and habitats. It is a cultural landscape with a rich and chequered history. It has been common land for several hundred years providing rough grazing and a range of products for those neighbouring properties with commoners rights. It has been used by the military for brief periods throughout its long history. On-site interpretation is mainly via 3 interpretive panels erected when the common was re-opened to the public in 2000. These are in the main car parks at the Control Tower, Pyle Hill and Crookham Hill. The panels are map boards with images of some of the wildlife on the common and a brief summary of points of interest and the history of the common. There is a leaflet of the same design which describes a series of themed walks across the common which take in some of the key features. Waymark posts with colours corresponding to those in the leaflet mark these routes on the ground. In addition there is a large board in the main (Control Tower) car park faced on one side with a collage of ceramic tiles produced by local schoolchildren and fired by a local artist, and on the other with a photographic image of the common. Similar structures are in place at two other West Berkshire Council nature reserves - Snelsmore Common and Hosehill Lake. A further interpretation panel has been installed in Compartment 6, giving information about the 2010-2012 heathland restoration project. 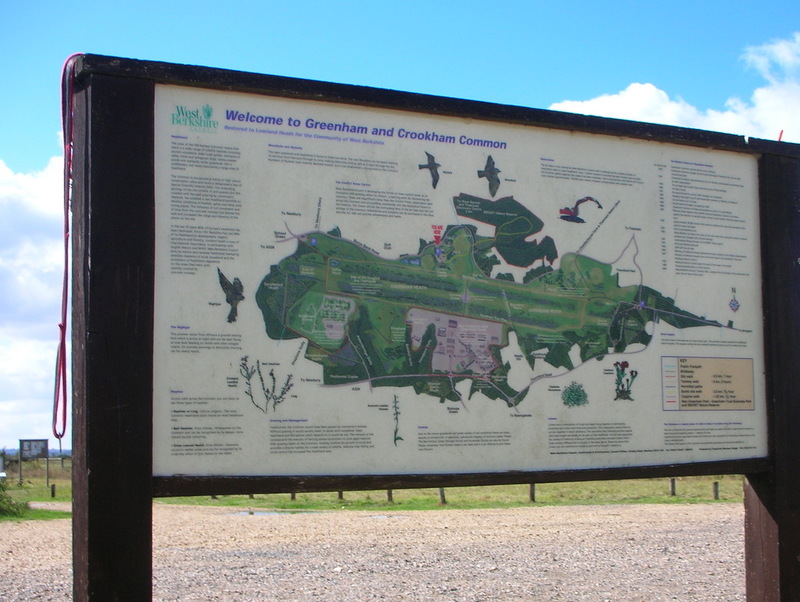 There is also information relating to the Common on West Berkshire Museum's website Greenham: a common inheritance (which includes many digitised images of the common both past and present), the Greenham and Crookham Commons Commission, and BBOWT's West Berkshire Living Landscape web page. A number of artists have used both the common and the Control Tower to exhibit works and to house 'installations'. There are good links with a network of artists through New Greenham Arts. Opportunities exist to increase the range and suitability of interpretive material for all visitors and to improve existing provision. Other less formal forms of interpretation, such as sculpture and other art or craft-based media, also have potential on the site. The involvement of the local community in these projects may be critical. The former airfield control tower next to the main car park, and its surrounding compound, are owned and managed by Greenham Parish Council. Renovation is (Jan 2015) under way, and the Parish Council has submitted plans to adapt the building to create a visitor centre. A cafe, public toilets and exhibtion/display space are expected to be provided. While not actually within the area covered by this management plan, these facilities will complement the recreational and educational opportunities which the commons offer. Further details of the proposals are available on the Greenham Parish Council website. Whilst there is currently no provision for formal educational visits to the common, there is a good deal of potential due to the size of the common, the range and diversity of habitats present, the rich history of the site and its cultural associations. The common presents an exciting opportunity to explore aspects of the primary and secondary curricula in an 'outdoor classroom' environment. The proximity to Newbury and Thatcham means there are a number of schools nearby which could benefit. An online activity pack for use by schools was produced in 2009. This project was funded by Greenham Common Trust. There may be some scope for an extension of this or the provision of a similar web-based learning tool but in many cases schools wish to follow up online activities with an actual visit to the site. Unfortunately this has hitherto proved impossible due to lack of staff on the ground to facilitate this. There is also potential for visits by students from higher education establishments. MSc students and undergraduates from two local Universities - Southampton and Reading - have undertaken periods of study here. There has been particular interest in both the ecology of the common and the effects of its former incarnation as an airbase. The sheer size, ecological diversity and complexity of the common provide an array of suitable subjects for a doctoral thesis, an MSc project or an undergraduate dissertation. Most of the countryside events on the common provide informal education and in some cases more structured learning for adults and children. Organised and run by the site ranger there is additional input from other experts where necessary. All events are advertised in the Countryside Service events guide. They range in content from traditional countryside skills such as besom broom making through ecology-based workshops (e.g. crickets and grasshoppers) to themed guided walks and 'meet the ponies' events. One avenue that has been explored at the Nature Discovery Centre is 'Forest Schools'. The premise of Forest Schools is that children should be outside for regular periods interacting with nature and the countryside around them. The emphasis is on children learning about nature and the environment and improving their physical and social skills. There is potential for the Forest Schools programme to be extended to Greenham and Crookham Commons. Re-design and update interpretive boards and site leaflet and replace existing boards and leaflet. The site is a gateway to, and part of, the West Berkshire Living Landscape Project, a partnership with the local Wildlife Trust (BBOWT). This partnership will be considered and recognised in the provision of any new material. Investigate and seek funding for alternative and novel forms of on-site and off-site interpretation and education such as audio or downloadable guides and web-based material. Investigate art-based forms of interpretation for the common such as a living sculpture trail, particularly where the local community is to be involved. This would be carried out in conjunction with New Greenham Arts and others. Update and improve the Greenham Common pages on the Council's website on a regular basis to provide the most up-to-date web-based information and interpretation. Investigate the possible extension of the RSPB Field Teacher programme, 'A Date with Nature', currently operating at the Nature Discovery Centre (in partnership with West Berkshire Council) to Greenham & Crookham Commons and/or the provision of a similar programme through the Living Landscape partnership with BBOWT. Continue to work with local schools and higher education establishments on specific projects. Select work that will benefit pupils and students whilst increasing knowledge and understanding of the common. Compile and regularly update a list of potential school and university projects that could be undertaken on the common together with suitable topics for any undergraduate, MSc or PhD dissertations and theses. Circulate this list to schools and higher education establishments annually. Select projects that will benefit pupils and students whilst increasing knowledge and understanding of the common. Select potential areas for Forest Schools activities on the common. Assess the likely level of demand, potential income and costs. Ascertain whether this can be provided by trained WBC staff or by a contractor and the relative cost-effectiveness of both.